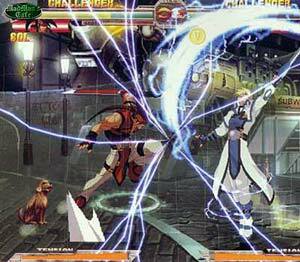 To play, the game comes on like a turbocharged super-funky cross between the first Last Blade game and the latest Capcom « vs. » games. While weapons-based fighters in the 2D arena are nothing new, the Samurai Spirits games were slow paced and fiendishly tactical, and until now only Last Blade games have had the pick-up-and-play immediacy of a Street Fighter game. 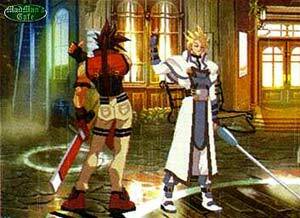 Guilty Gear X ignores SNK’s overly-helpful Last Blade 2 (which did far too much automatically and took a lot of choice away from the player as far as combos were concerned) and takes up where the first Last Blade left off, adding a multitude of new gameplay elements to it – air dashes, super jumps, double and triple jumps, aerial combos, multiple blocking tactics, the « destroy » move which, if you pull it off, you will win, if you don’t, you’ll be left with no super gauge for the rest of the round – the number of additions to the gameplay is almost overwhelming at first, but they quickly become second nature, and, more tellingly, you will start to miss some of the features in this game while playing other, more established, series. There are only four attack buttons.. Three of these are assigned to weapon attacks of varying power and speed, the other is a kick button; the triggers are used for taunting and respecting opponents. Most of the specials in this game are based on the standard quarter- or half-circle motions which gamers have been used to for some time. The supers are generally SNK-style half-circle-back-then-straight-forward, which Capcom aficionados used to two-quarter-circles might struggle to come to terms with initially. The system works very well, the lack of varying strength kicks does not detract from the gameplay, and the controls are tight and responsive.